I'd be lying if I didn't say that I wanted to go to Greece for the sole reason of getting the above picture. That is to say, I did have other reasons, too, but I would've chalked the trip up to a win if we'd only gotten this picture and nothing else. But thankfully we stayed for several nights and drank our fill of the twisting lanes, traditional cave housing, and sunsets of Santorini. The town of Oia (pronounced "Ee-ah") is perched on the northern end of the caldera that forms the island of Thira (or Santorini as it's popularly known). If you guessed that the island rock is volcanic, you'd be correct. Santorini is an active volcano that last erupted in 1956, destroying many buildings on the island. When those who remained on the island began to rebuild, they did so with an eye for aesthetics and with the keen business sense to appeal to tourism. 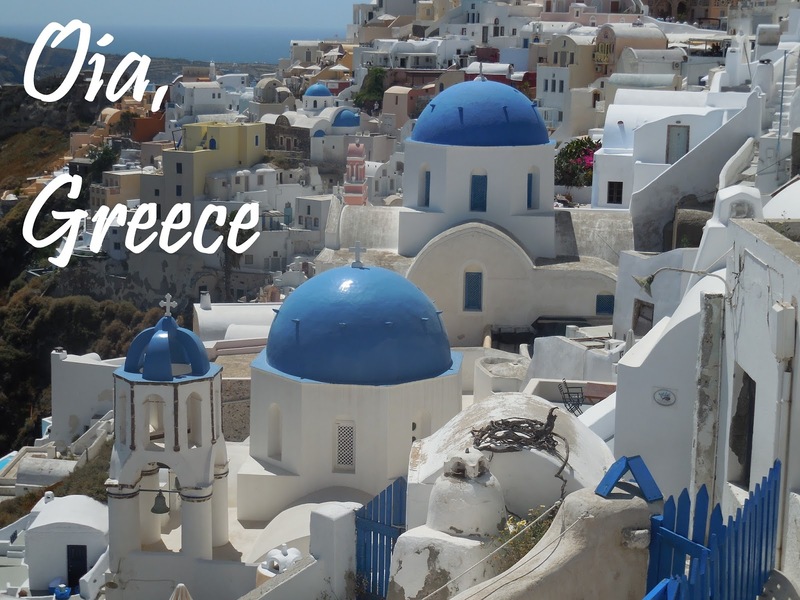 As such, the white-washed houses and blue-domed churches of Oia and the rest of the island have become an iconic vision of the Greek islands and are responsible for luring thousands of tourists to come spend their money wandering the beautiful streets. There is nothing historic in Oia. Most of the buildings are no more than 60 years old due to the volcanic eruption in 1956, but here the main attraction is simply the town and island itself. The raw beauty of Oia is stunning; where else in the world do you find crowds that applaud simply in response to a sunset? This place was made for romantics. But judge for yourself. Ah, yes, the money shot! Where else in the world does one applaud after a sunset? If you find yourself planning a trip to Santorini, do yourself a favor and stay in Oia, even if you can't afford a caldera-view hotel. Just being in the town itself will be worth your while. * We recommend staying at the Oia's Sunset located near the town square. It is not caldera view, but the rooms are spacious, have a traditional feel, and Panos will make you feel more like an old family friend than a stranger. A review of our stay will be forthcoming! Thanks! It's one of the few places that I can really picture myself revisiting again and again! I know, right?! We ended up with several hundred photos just from the two days we were there! This sounds wonderful! Oia is gorgeous. It's just as beautiful as all the pictures. Even on an overcast day! So pretty, I would love to go there one day, I love all the whitewashed houses with blue roofs! No trip to Santorini would be complete without a late after trek to Oia to watch the sunset. I hope you also went to Red Beach and saw the Akrotiri Archaeological site. Haha I would totally just go to Santorini for one of these pictures!! It looks so gorgeous!!! Beautiful! I was in Santorini in 1987, a looong time ago. It was beautiful but disorganized, not the tourism hot spot it is today. Would love to go back though and see what it's like today. Maybe sometime next summer, we'll be in Albania and Montenegro so we might pop over. Gosh that really is a money shot! So so cool how you got to visit such an iconic location -- I'm pretty sure this is the place everyone pictures when they think of Greece! Soon pretty! I am beyond jealous of anyone spending time in Greece these days. If it only wasn't so far from Australia I would be there in a heartbeat. Baby Gypsy: Herr or Her?